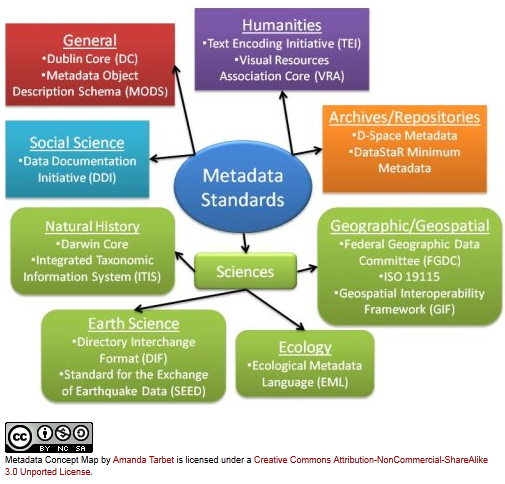 CSDGM Extensions for Remote Sensing Geographic Data metadata describing geospatial data obtained from remote sensing. DwC - Darwin Core Biology primarily based on taxa, their occurrence in nature as documented by observations, specimens, and samples, and related information. EAD - Encoded Archival Description Archives standard for the encoding of finding aids for use in a networked (online) environment. Finding aids are inventories, indexes, or guides that are created by archival and manuscript repositories to provide information about specific collections. GILS - Government Information Locator Service Government standard so that governments, companies, or other organizations can help searchers find collections of information, as well as specific information in the collections. MARC – Machine Readable Cataloguing for Library Library Resources "formats are standards for the representation and communication of bibliographic and related information in machine-readable form"
MEI - Music Encoding Initiative Music an XML DTD for the representation and exchange of music information. It is designed to be comprehensive, that is, it provides ways to encode data from all the separate domains, i.e. logical, visual, gestural (performance), and analytical, commonly associated with music. OCHRE -- Online Cultural Heritage Research Environment Archaeology intended for researchers engaged in artifactual and textual studies of various kinds. It is especially suitable (1) for organizing and publishing the results of archaeological excavations and surveys and (2) for preparing and disseminating philological text editions and dictionaries.